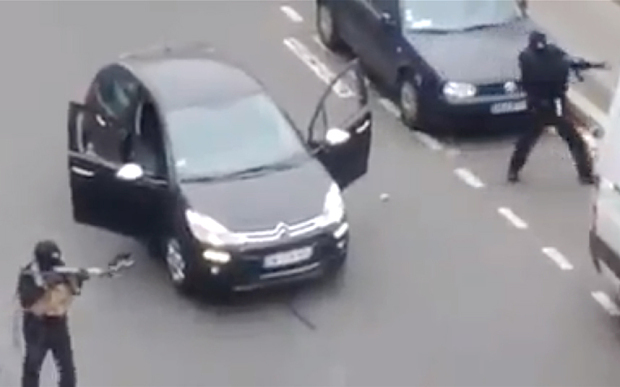 Executions in Yabroud Prove Paris Police Shooting a Total Fabrication. The images I am going to use here are bloody and unpleasant and depict real violence and death. These stills come from a video shot in Syria in early 2014. The Syrian Army and Hezbollah fighters succeeded in dislodging the rebel jihadists from their stronghold in Western Syria, a town named Yabroud. Following the battle, Hezbollah captured a number of fighters, apparently from the Jabhat al Nusra, al Qaeda’s Syrian franchise. 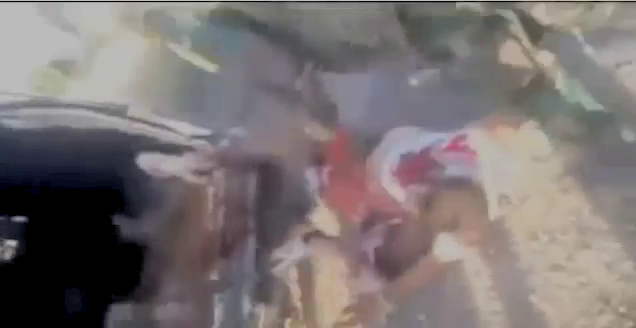 The prisoners are filmed being interrogated and beaten by the Hezbollah fighters on the roof of a building. Later they are pictured ,bloody and piled up in the rear of a van. The fighters are pulled from the van after a radio message. 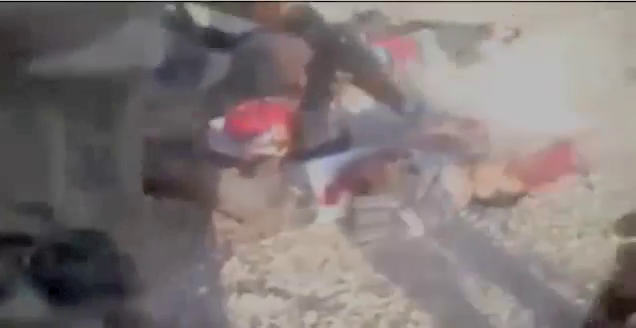 At this point it appears that the fighters receive a radio message telling them that they should execute the prisoners, as after receiving a communication, they pull the Jabhat al Nusra fighters from the van and proceed to execute them at close range using AK 47 Assault Rifles, just as the supposed Charlie Hebdo terrorists used. This video was a big embarrassment to Hezbollah and the group claimed to have taken disciplinary action against individuals involved in the filming of these events. I am not trying to impugn or single out Hezbollah.Every military group commits excesses on occasion without any exception. the point is this is not an IS style propaganda video. I actually intended to use IS execution footage to make the point I am going to make but the IS gunfire executions that I watched did not appear to be authentic. Hezbollah are a very high quality military group and they have shown this repeatedly on the battlefields of Lebanon and Syria. This video shows Hezbollah fighters conducting a frontal assault on a hillside controlled by the IS group with devastating consequences for the IS fighters. They just run straight up a steep hill into the teeth of fire and kill them. Regardless of politics or ideology it is impressive stuff. 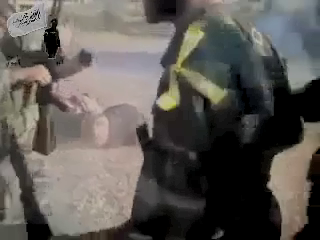 Hezbollah vs ISIS (face to face)- Must Watch !!! Hezbollah’s success in Syria was reflected in the fact that following the fall of Qusair in May 2013, the defeated jihadists began to wage a terror campaign against civilian targets in Lebanon, murdering dozens in a series of car bomb attacks aimed at pro- Hezbollah areas. 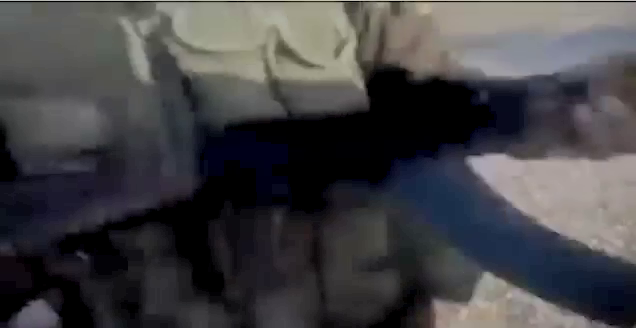 The point of showing this rather gruesome and unpleasant footage is that it shows us precisely what an AK 47 fired at a human head from close range looks like. The reason for this is to highlight the stark contrast between the real thing in Syria and what happened in Paris last week. These images are unpleasant and I am not seeking to celebrate or downplay this death. The crimes of Jabhat al Nusra are mammoth and they were the author’s of the false flag chemical weapons attacks in 2013, that killed hundreds of Syrians. 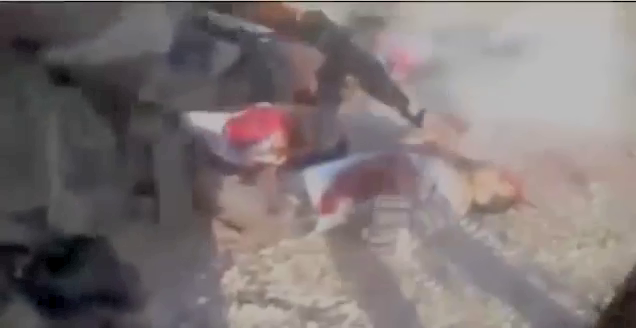 This execution is a crime, I would suggest that the crimes of Jabhat al Nusra are far greater than this crime. We know the men we see are Hezbollah fighters because Hezbollah fighters in Syria wear regular military uniforms but they have an identifying yellow ribbon on the shoulder. We can clearly see that these men are armed with the AK 47 Kalashnikov with the classic curved magazine. . The prisoner is on the ground having been roughly dragged from a van. The prisoner is shot in the head by the AK 47. A large amount of blood emerges from his head immediately, his entire body is convulsed by the impact of the round. The prisoner is dead. A very unpleasant scene. A pool of blood is easily identified under and around his head and it almost appears that the top of his head has been blown off. This footage is wretched in quality compared to the scene depicting the murder of Ahmed Erabat, which is clearly shot on a very good camera. But in Paris there is simply nothing to see. Nothing happens when the policeman is shot in the head. 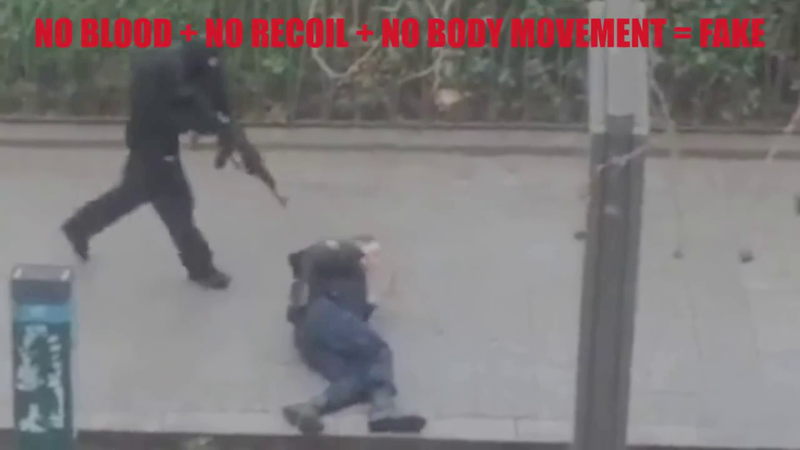 No convulsion, no blood, no back of the head blown off, no gush, no bone, no muzzle flash, no expelled cartridge. Nothing. It is not a good argument, but it is all they have. The reason it is no good is that they have tried to suppress the “sanitised” footage itself. Why would they want to suppress that which had already been sanitised? It is nonsense. 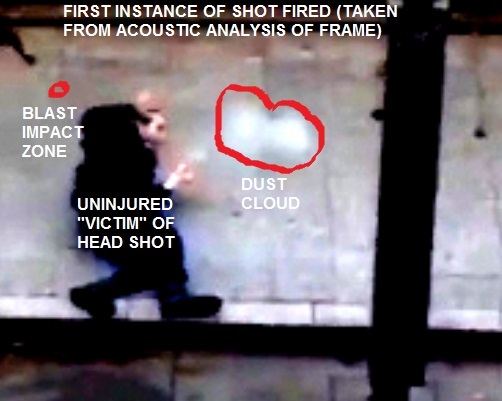 Planted Evidence Part od a Classic pattern of Deception Seen in Previous False Flag Attacks. Many people know about the incongruous Shia red bandanna and passport planted in the planeless Pennsylvania field, and everyone knows of the insulting story of the pristine passport found on the ground on New York following the explosive destruction of the World Trade Centre but my favourite 911 planted evidence is a little more obscure. On September the 9th, 2001, a sports bag was left at a Maryland Mosque. Attached to the sports bag was a note reading “A gift for the brothers.” Very amusing. Where does this astonishing and damning information come from”? The FBI. The really devastating fact about the bag left at the Maryland mosque was that it contained the receipts for flying lessons taken by the “hijackers” more than a year earlier. Isn’t that just sweet! We are expected to believe that some Muslim suicidal terrorist thought it was important to carry around ancient receipts for flight training and then leave them at a Mosque. It is one of those classic moments when they get a little cute, a little clever-clever and reveal themselves. If we look at the footage of the supposed Charlie Hebdo shooters Said and Cherif Kouachi as they run around on the street. Their clothing is consistent with the clothing of soldiers or guerrillas. The clothes they wear are not loose fitting at all. There e is no way that people dressed like that, who bothered to pick up a random shoe in the street for unknown reasons while purportedly leaving the scene of a massacre they had conducted would ever, ever be so “careless” and idiotic as to leave their ID behind. This is beyond a little too convenient, it is farcical. This is not Ottawa or Sydney, a pathetic sideshow to pass new Security Bills. This is a serious attempt from the forces of darkness and evil to revive the entire Clash of Civilisations narrative so that they can return to major war on Israel’s enemies that could seet ens of millions dead under a worst case scenario. We can’t walk away from this one as largely happened with Sydney and Ottawa. These false flags are laughable in many ways, but this is deadly serious. 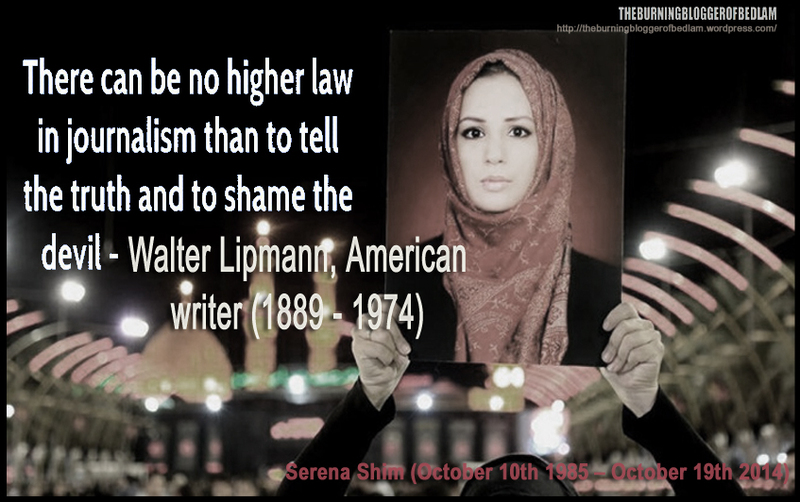 These crimes are just the little crimes that give birth to the real crimes, the wars of aggression that we have repeatedly seen destroy nations all in the name of bogus national security or in the name of fake Western liberation. We can’t walk away from this.